Get rough and ready! We're repurposing bullet casings to make stylish ammo earrings while at the same time learning the fundamentals of cold-working metal. Techniques include safety, punching, sawing, filing, texturing, and basic wire work. BYOB: bring or buy your own beads to reflect your personal color palette. Un-tinted safety or reading glasses are a must and dress for a mess. No experience is necessary. The materials fee paid to the instructor covers supplies, handouts and use of tools. Make jewelry not war. This elegant and understated design contains within it the foundation for infinite variations. Join us in learning short cuts to hammering, piercing, patination and polishing. Bring un-tinted safety or reading glasses. No experience is necessary. The materials fee paid to the instructor covers supplies, handouts and use of tools. Create pendants, house blessings, pocket-pieces and buttons by carving your designs into investment and casting them in lead-free pewter. This low-tech and inexpensive technique is perfect for making multiple pieces. There is no experience necessary, and the focus will be on experimentation in a relaxed atmosphere. All you need to bring is a very clean tuna can. Be sure to wear closed-toed shoes made of non-synthetic materials and dress for a mess. The fee paid to the instructor covers supplies, handouts and use of tools. This technique has been adapted from the traditional (hot) version which includes torch soldering and a lot of steps in the process. 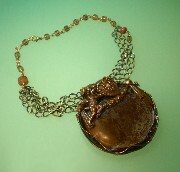 In the �cold� version, the object (stone, sea glass, cabochon, etc.) is held by tension and is structurally just as sound as the soldered counterpart. Students will learn how to choose an appropriate stone, customize and plan their design, polish and permanently set the bezel. Bring your treasures for discussion and possible inclusion. Don't forget reading (or untinted) safety glasses. No experience necessary. The material fee paid to the instructor covers supplies, handouts and use of tools. What is a distance learning class? It is a way for you to learn from anywhere in the world! This distance learning project is the same as the one I teach in the classroom except that it will be delivered to you via the internet. Click here for more information. Students will have the opportunity to work with pre-made textured panels of shibuichi. The highly detailed, three-dimensional motif is all about bones. 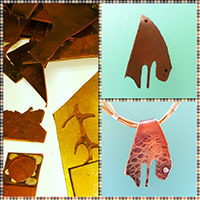 Metalsmithing techniques include piercing, sawing, filing, sanding and light polishing. 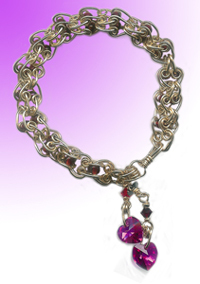 In addition, students will explore chain link designs to connect their panels into a bracelet, pendant or earrings. BYOB: bring/buy your own (stone) beads to reflect your personal palette. Don�t forget your reading (or non-tinted) glasses for safety! No experience necessary. The materials fee paid to the instructor covers supplies, handouts and use of tools. Who knew that cutting and shaping metal was so easy? Ideal for beginners or those just wanting to simplify their tool box and skills. 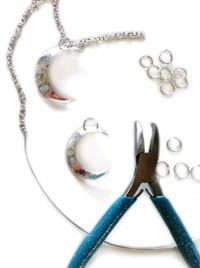 We will create two fabulous, sterling crescent moons pendants plus one hand made chain and clasp. The skills involved are transferable to making other, simple shapes. Got charms or beads? Bring them for discussion and possible embellishment. No experience is necessary. Bring your glasses for detailed work. The materials fee paid to the instructor covers supplies, handouts and use of tools. 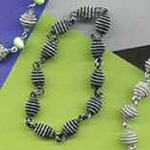 This workshop will teach you how to frame your special beads with an intricate coiling technique. The spiral design suspends each gemstone in a cocoon of silver. Students will learn how to use basic wire working tools, coil wire by hand, and combine the coiled elements with a handmade chain and clasp. BYOB: bring your own beads (12-24mm) for variations on the design. The materials fee paid to the instructor covers supplies, handouts and use of tools. Say that ten times fast! Why spend all of that time creating a unique, handmade chain and then top it off with a predictable machine made clasp? Students will learn the fundamentals of how wire works. 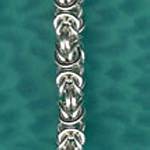 Techniques include forming, hammering and twisting different metals together. BYOB: Students are encouraged to bring/buy their own beads with holes that fit 16 gauge wire. There is no experience necessary and experimentation is encouraged. The materials fee paid to the instructor covers supplies, handouts and use of tools. 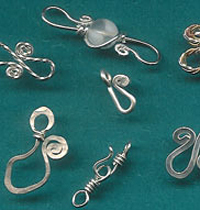 Distinguish yourself (and your jewelry line) by creating unique clasp solutions. Topics include: exploring pattern making, understanding and choosing appropriate sheet metal, sawing, filing and various surface finishing techniques. No experience is necessary. The materials fee paid to the instructor covers supplies, handouts and use of tools. Don�t forget your untinted safety and/or reading glasses and dress for a mess. This workshop is a cold variation of the techniques referred to as kirihame zogan (Japanese), metales casados (Mexican), marriage of metals and mosaic. Students will learn how to, create a model, use a jeweler�s saw, file, and permanently combine differently colored metals without the use of heat, glue or toxic materials. The result is a piece of jewelry that contains details on both the interior and exterior of its form. No experience necessary. The materials fee paid directly to the instructor covers supplies, handouts and use of tools. Don�t forget your untinted reading or safety glasses and dress for a mess. Learn to make jewelry without investing in a lot of equipment, tools and workspace. Explore a range of chain-making designs that do not rely on heat and can be carried around like knitting and worked on anywhere you can sit down. Design choices range from simple to complex. Copper, brass, sterling and gold-filled wire will be used. Students are encouraged to bring their collections of beads and baubles to class. The materials fee paid to the instructor covers supplies, handouts and use of tools. Crocheting with wire sounds pretty straight forward, but it is different than crocheting with yarn or thread. Manipulating wire requires a deeper knowledge of metal & and it's properties; such as what type is appropriate to work with, purchase and wear. Topics also include how to handle wire so that it doesn't break, creating a closed design, integrating a clasp into the design and how to use color and embellishment to express your creativity. Don't forget your untainted safety and/or magnifying glasses. No experience necessary. The materials fee paid to the instructor covers all supplies, handouts and use of tools. This project is delicate, dainty and divine! You can wear it as a necklace or bracelet. Designed for students who have tons of beads and/or organic treasures that they would like to capture without drilling or gluing. Bring your shells, pebbles, sea glass, beads, broken jewelry parts and found objects for discussion and possible use. 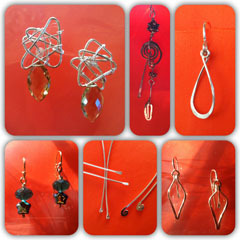 Other topics include: designing with color to evoke a mood, wire wrapping, and tension construction. No experience necessary. BYOB: (bring/buy your own beads to reflect your personal palette). Don�t forget your reading (or non-tinted) glasses for safety. The materials fee paid to the instructor covers all other supplies, handouts and use of tools. 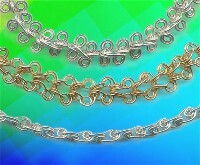 The jig acts as a template to create exact, intricate and/or interlocking chain links. This clever tool enables the user to work more efficiently when tackling complex and highly ornamental designs. Students will learn how to build their own low-tech jig and can choose between sterling silver and gold-filled wire to create their necklaces. No experience is necessary. The materials fee paid to the instructor covers supplies, handouts and use of tools. Wear it and share it! Simple to make, this fanciful chain is constructed out of double hearts, inter-linking to create a surprisingly lush design. Students may choose to work with sterling silver or 14-karat gold-filled wires. Basic use of chain-making tools will be covered. No experience is necessary. BYOB: bring your own beads (to fit 20g wire) for embellishment. The materials fee paid to the instructor covers all other supplies, handouts and use of tools. 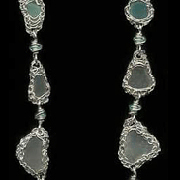 Also known as the Egyptian Chain, this is an ancient wire design technique from the Etruscan period, around the 7th century BCE. Learn to create swirled links and their variations, which can be made into earrings, bracelets or clasps. 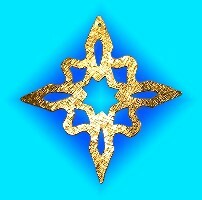 In the Goddess culture, this symbol has been equated with the eyes of the Goddess (twin suns equaling regeneration), ram horns (a symbol of abundance) and the tree of life (cyclical growth and change). We will be working in sterling and gold-fill. No experience is necessary. The materials fee paid to the instructor covers supplies, handouts and use of tools. What is a distance learning class? It is a way for you to learn from anywhere in the world! This distance learning technique is the same as what I teach in the classroom except that it will be delivered to you via the internet. Click here for more information. I grew up under the influence of watching my German mother painstakingly hand make exquisitely detailed doilies, tablecloths and bedspreads. 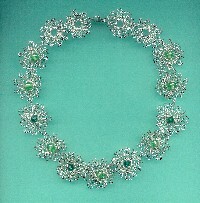 Although needlework never caught on with me, I always envisioned wearing some of the patterns as jewelry. In 2005 I returned to North Carolina to have her teach me the basics. Together we came up with a silver daisy pattern, in honor of her (favorite flower). 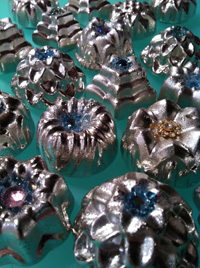 BYOB: bring your own bead box to embellish the daisy components. The materials fee paid to the instructor covers all other supplies, handouts and use of tools. No experience necessary. This workshop focuses on harnessing all those little found objects that have washed up in your life and are waiting to be used. Baubles, beads, hardware, costume jewelry parts, buttons, natural items, etc. will be combined with copper and brass wires. Basic jewelry tools and chain-making techniques will be covered. Students are encouraged to bring their collections of treasures and beads to add to our own. No experience is necessary. The materials fee paid to the instructor covers supplies, handouts and use of tools. This project is a great introduction to working with sculptural objects and basic wire techniques. 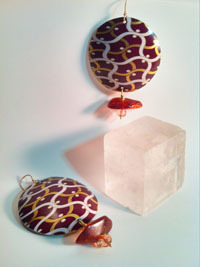 The finished pieces can be used as jewelry, beads, house blessings or simply as an objet d�arte. Students will have several shapes to choose from. BYOB: bring your own bead box and broken costume jewelry pieces for possible embellishment. Don�t forget your reading and/or untinted safety glasses. No experience necessary. The materials fee covers all other supplies, handouts and use of tools. Have you noticed that hoop earrings come in all shapes, sizes, and types of metals? That�s because they never go out of style! In this workshop, we will be exploring low-tech and inexpensive techniques for making various hoop-styles from scratch. Learn to plan, shape, texture, harden and polish your one-of-a-kind hoops. 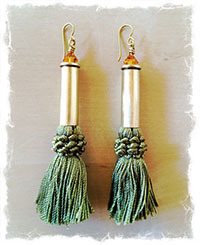 BYOB: bring/buy your own beads (and favorite ear wires) for possible embellishment. There is no experience necessary. Dress comfortably and don�t forget your untinted reading or safety glasses. The $45.00 materials fee paid to the instructor covers all other supplies and use of tools. If you enjoy puzzles or if you are puzzle-challenged, you will be enchanted by this project. The Idiots Delight Link (also known as the Byzantine and Kings Link) is a brainteaser unless you know the secrets of its construction. After learning how to make jump rings, we will fashion this classic design into a bracelet. We will work with sterling silver. No experience is necessary. The materials fee paid to the instructor covers supplies, handouts and use of tools. Interested in expressing yourself in a totally unique way? Students will have the opportunity to choose from different templates, practice drawing, experiment with engraving, then transfer their design to metal. 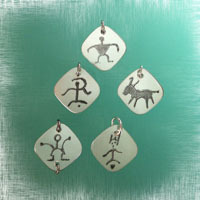 The resulting pendants are permanent and personal. In addition we will make customized jump rings. Skills learned can be used for creating other subject matter as well. Bring sketches or images for discussion, inspiration and possible use. Got beads? Bring them for embellishment options. No experience is necessary. The materials fee paid to the instructor covers supplies, handouts and use of tools. What the simple wheel did for technology, the jump ring did for jewelry. 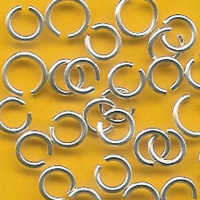 Yes, you can easily buy them from a manufacturer, but learning how to make your own jump ring puts you in the driver�s seat: you get to choose the size, thickness and metal that is appropriate for your hand-made jewelry. Students will learn how to test their techniques in terms of structural integrity (is it strong or flimsy? ), aesthetics (is it tortured or svelte?) and wearability (is it a hair and clothing nightmare?). 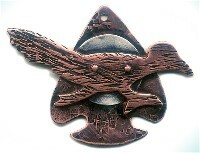 We will work in copper, sterling and fine silver. No experience is necessary. The materials fee paid to the instructor covers supplies, handouts and use of tools. This bead design named after an Afghani tribe is intricate in detail yet easy to make. Low tech, everything you need to create this cold-worked bracelet can be carried around. Students will learn how to use basic wire-working tools, coil wire by hand, combine bracelet elements, use patinas and estimate materials to customize a roll-on bracelet. Optional: Students are encouraged to bring 8mm beads for variations on the design. No experience is necessary. The materials fee paid to the instructor covers supplies, handouts and use of tools. Using a simple ladder concept, this workshop combines ancient hand wrought techniques (wire manipulation, hammering, filing, stamping, engraving, texturing, polishing) with customization (stamping, engraving) to create a personal, laid back look. Topics cover metal characteristics, temper, design and customizing decisions, resources, plus utilizing scraps and found objects. 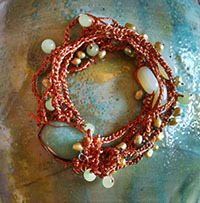 BYOB: bring/buy your own beads (fit 18-20gauge wire) plus found objects to reflect your color palette. Don�t forget your untinted safety or reading glasses. No experience necessary. The fee paid to the instructor covers supplies, handouts and use of tools. 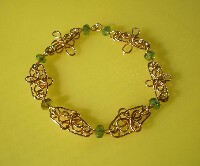 First offered at the Green Horn Dude Ranch, Quincy California in 2009 as a weekend retreat project, this popular bracelet is a favorite for beginners (who are learning basic wire techniques) as well as intermediate and advanced students (working on content). Wanna get lucky? Sign up for this workshop and bring your own found objects to harness and create a personalized totem. The fee, paid to the instructor covers all other materials, handouts and use of tools. We will be working with silver and copper. No experience necessary. Don't forget your untinted reading or safety glasses. Cozy up with us on a cold winter's day to translate a childhood hobby into a metal Object d'Art. Students will learn how to make a snowflake, transfer the design, manipulate exterior and interior cuts, file and explore surface treatments. In addition, students will learn how to sign their piece (or write a message to a loved one). Don�t forget your reading (or non-tinted) glasses for safety. No experience is necessary. The materials fee paid to the instructor covers supplies, handouts and use of tools. Spend some quality time with your creativity! Assemblage is the combining of found objects such as scraps, junk, paper, cloth, wood, stone, or metal, to create a composition. In this workshop students will begin their project with sheet metal, arrange their objects and then permanently combine them using cold metalsmithing techniques. Topics covered include: basic wire work, filing, punching, riveting, tension setting, folding/slotting, hammering and surface texturing. We will also discuss inspiration, coloring metal, content and creating narrative compositions. BYOB (bring/buy your own beads, found objects, broken costume jewelry etc. to personalize your piece). The materials fee covers all other supplies, handouts and use of tools. Don�t forget reading or untinted safety glasses and dress for a mess. Reminiscent of laying back in a sunny meadow, gazing at clouds, and allowing your imagination to flourish; this workshop solidifies imagery into wearable pieces of art. Students will learn to �gaze� at metal, unlock their unconscious, tap into their internal dialogue and �see� shapes. Examples of imagery may include: totems, animal spirits, religious imagery, personal & cultural iconography, prophesies, preoccupations, questions, answers, insights etc. Metalsmithing skills for metal manifestations include, cutting, filing, texturing, riveting, piercing, polishing and surface decoration. 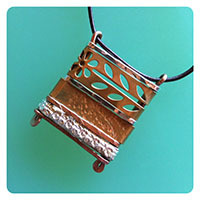 Primary metals used are copper and brass but techniques lend themselves to other jewelry metals such as silver and gold. Bring un-tinted safety or reading glasses for detail work. Students are also encouraged to bring found objects to spark discussion and possibly use (unfinished projects, scrap metal, broken costume jewelry, bead collection, etc.) No experience is necessary. The materials fee paid to the instructor covers supplies, handouts and use of tools. Simple, elegant and so easy to make. 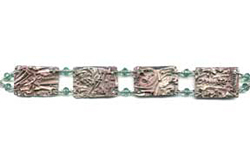 This bracelet combines ancient handwrought techniques with modern technology. 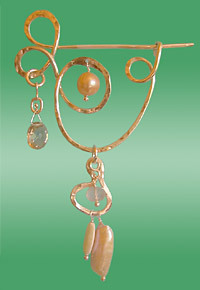 Metalsmithing techniques include wire manipulation, hammering, filing and polishing. 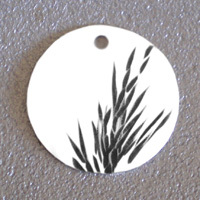 Students can incorporate beads or allow the metal to shimmer by itself. BYOB: bring/buy your own beads (that fit 16g wire) to reflect your favorite palette. Don�t forget to bring your untinted safety or reading glasses. No experience necessary. The fee paid to the instructor covers supplies, handouts and use of tools. 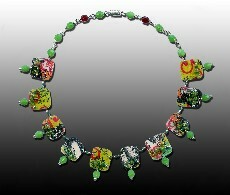 Having professional photos of your jewelry projects is an important step in marketing your work (on line and in print). Other useful applications include documenting, archiving, proof of development, applying to shows, competitions, employment applications and generally maintaining your portfolio. This workshop is for students of all levels. Please bring your lap top (including electrical cords, power strip and photo editing program), digital camera (minimum 6.0 megapixels, cords to transfer images to laptop, extra battery, battery charger). Don�t forget your jewelry projects, reading glasses and (optional) props to express your personal, creative sensibility. Become familiar with your laptop, photo editing features and practice transferring digital images to your laptop. By becoming comfortable with these items and tasks you will be able to focus class time on setting up shots and photo editing. In this workshop, students will learn different techniques that are the basic building blocks to making professional head pins, ear wires and connectors from scratch. In addition, we will cover the secrets of hardened and polished findings. No more posts that poke and designs that quickly become hair night mares! Got stretched lobes? Prefer post earrings to French wires? We'll discuss creative earring solutions for that too. BYOB (bring your own beads) for embellishment and to reflect your personal style/palette. No experience necessary. The materials fee paid to the instructor covers all other supplies, handouts and use of tools. 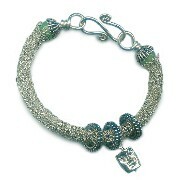 Do your part to recycle materials while surprising folks with fabulous bracelets and earrings! In this workshop, students will learn how to find and recycle plastic, organize them through the Elements of Design (line, shape, direction, size, texture, color, value), and combine them using simple metalsmithing techniques. BYOB: bring/buy your own assortment of beads for embellishment. No experience necessary. The materials fee paid to the instructor covers all other supplies, handouts and use of tools. An introduction to repurposing decorative tins, this workshop includes valuable metalsmithing techniques that are applicable to precious metals. Topics include design weight (visual and literal), cutting, piercing, forming, finishing edges and safety. We will also focus on strategies for dealing with (existing) enamel paint and embossing. Although provided (via your materials fee), please bring tins for possible discussion and use, plus beads for embellishment opportunities. Don�t forget your reading and/or safety glasses. No experience necessary. The materials fee paid to the instructor covers supplies, handouts and use of tools. Riveting is a cold process used to join metals together and can also serve as a decorative element in a piece of jewelry. The advantage over soldering is the lack of toxic materials, and the tools are simple to use, store and transport. 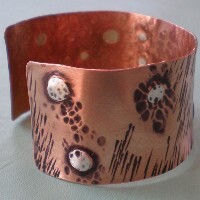 We will examine design strategies and experiment with different metals such as copper, brass, sterling and fine silver. No experience is necessary. Materials required for the class will be provided. The materials fee paid to the instructor covers supplies, handouts and use of tools. This delicate necklace is the envy of mermaids and mermen! Lighter than air, you won't even feel it on your skin. 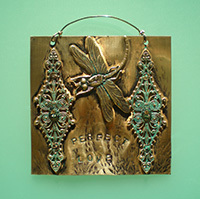 Students will learn how to work with basic jewelry tools and thin gauges of wire. 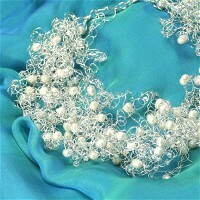 In addition, we will discuss how to custom-balance each piece and create a clasp. No experience is necessary. The materials fee paid to the instructor covers supplies, handouts and use of tools. 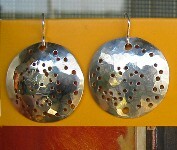 In this workshop students will create a bracelet and earring set composed of perforated sterling. 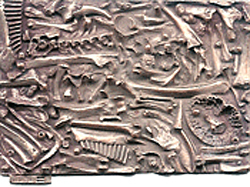 Techniques include piercing and cold-connecting metal; creating surface textures, hammering, burnishing and polishing. This simple, low-tech class doesn't even use electricity! There is no experience necessary. The materials fee paid to the instructor covers supplies, handouts and use of tools. This workshop is an excellent introduction to hammering. 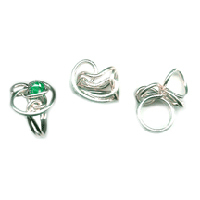 Through the use of simple tools, we will bend wire into an abstract form that functions as a spring, hook and clasp. Students will also learn how to texture and shape heavy-gauge fine silver using various hammering techniques. The result is a delicate and subtle elegance that is best shown-off on loosely woven fabrics. No experience is necessary. BYOBBB (bring your own beads/baubles/buttons for embellishment and to add to selection that is provided). The materials fee paid to the instructor covers supplies, handouts and use of tools. Abstract, bold and with a hint of flower power, this ring workshop is a great way to experience heavy wire manipulation. Students will learn about the properties of metals, ring sizing, resources and the popular tool talk. Do you want to work in a toxic-free environment? Do you enjoy projects that are fast, simple and spontaneous? Then this one's for you! No experience is necessary. BOYB: Bring/buy your own beads for embellishment. The materials fee paid to the instructor covers all other supplies (for a maximum of 3 rings), handouts and use of tools. The beauty of these three designs are that they use exactly the same links and were cold connected. Students will have the time to make samples of the "Opposites Attract," "Maui Waves" and "Hidden Hearts" links. My over achievers can probably finish a whole bracelet. In addition, instructions for the clasps will be included. No experience is necessary. The materials fee paid to the instructor covers supplies, handouts and use of tools. This (all levels) workshop was designed to weave a flat, pattern, similar to fishing nets, with a minimum amount of tools and maximum portability i.e. It�s so easy, you can do it anywhere. The delicate-looking design is durable, yet lightweight, which enables students to create small or large projects. Once students get the hang of the basic technique, we will expand into using the mesh as a bezel or sandwich (with a window) to capture objects securely. BYOB: bring/buy your sea glass, pebbles, cabochons, charms or other small treasures. Got beads? They can work as embellishment. Don�t forget your glasses for detailed work. No experience necessary. The materials fee paid to the instructor covers all other supplies, handouts and use of tools. Using only two elements, an awl and sterling silver wire, we will explore the technique of fashioning a rope out of metal. This self-supported "knitted" form is flexible and comfortable to wear. It also offers a terrific surface for easy embellishment. Students are encouraged to bring their favorite assortment of beads to add to those of our own. No experience is necessary. The materials fee paid to the instructor covers supplies, handouts and use of tools. Once you have the hang of making a free-standing Viking Knit rope, you�ll be ready to move to the next level of skill needed to capture objects within. The Viking Knit cage is a great form for permanently holding gemstones, beads and other rounded objects. The materials fee paid to the instructor covers supplies, handouts and use of tools. Are you looking for cold ways to create a bezel setting? Once you have mastered the free standing forms explored in Viking Knit 1 & 2, you can easily learn how to create a knitted version of the traditional bezel. Pioneered by Sandkühler, the Viking Knit Bezel technique works well with odd- and flat- shaped stones and undrilled "beads". The materials fee paid to the instructor covers supplies, handouts and use of tools. 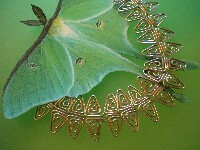 Using gold-filled wire, we will construct a whimsical shape that resembles a simple line drawing. By using beads to fill selected areas, the pendant-sized piece becomes a densely encrusted object that reflects light and sparkles like a jewel. Wear it or use it as an ornament. The form will be simple, with an emphasis on texture and color. Students are encouraged to bring beads to add to those of our own. No experience is necessary. The materials fee paid to the instructor covers supplies, handouts and use of tools. This wire workshop is an introduction to the concepts of prong- and bezel setting. Explorations will be centered on capturing flat-backed stones, sea glass and other found objects through weaving and simple, nontraditional strategies. 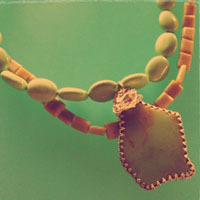 The results are playful and creative pieces of jewelry. Students will also learn about basic wire-working tools and how to care for them. BYOB: bring/buy your own assortment of flat backed stones, beach glass and other found objects for discussion and possible use. Don�t forget your untinted safety glasses. No experience is necessary. The materials fee paid to the instructor covers all other supplies, handouts and use of tools. 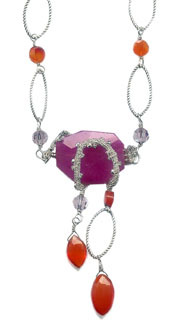 Fast and fabulous, this whimsical necklace will leave you wondering whether or not to give it as a gift or wear it to your favorite social gathering. Using only two elements, wire and tiny beads, we will explore the technique of knotting strands of wire to create an elegant wreath necklace. This delicate design is flexible and comfortable to wear. 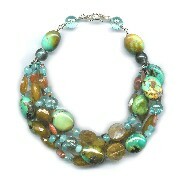 Add larger beads if you prefer to make a bold and dramatic statement. Students are encouraged to bring their favorite assortments of beads to add to those of our own. No experience is necessary. The materials fee paid to the instructor covers supplies, handouts and use of tools. 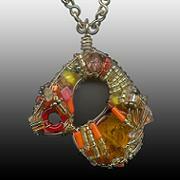 Interested in jewelry making but don�t know where to begin? 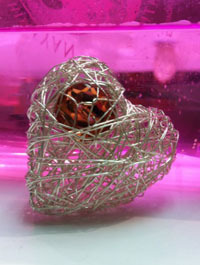 This workshop is a great introduction to the basic tools and materials needed for working with wire. 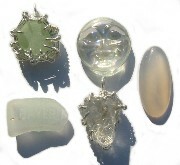 We will focus on simple techniques to permanently (and securely) capture cabochons and irregularly shaped stones to create pendants. An alternative to the more traditional bezels that require a torch, this method of framing your found object is also a great primer in understanding the concept of how a bezel works. No experience necessary. Bring your own stones for discussion and possible use. The materials fee covers all other supplies, handouts and use of tools. Don�t forget reading or untinted safety glasses.